Looking over the past blogs I noticed we never really covered what fibropapilloma is. 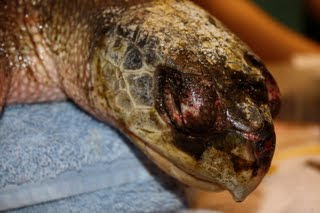 Fibropapilloma is type of herpes virus that inflicts sea turtles. It mostly affects green sea turtles, but there are cases in loggerhead, olive ridley, and flatback sea turtles as well. There is also anectdotal evidence in kemp's ridley, hawksbill and leatherback sea turtles. The virus occurs globally. The majority of the tumors are benign meaning that the tumor themselves will not kill the animal. However, tumors of the eyes, mouth and internal tumors can hinder the animal's ability to forage for food. Large tumors can also add drag to the turtles which, can slow the animal, making it easy prey. Smooth small paps to the left, a large bulbous "cauliflower" pap to the right (the reddish color is iodine). There are varieties of tumors. Some are smooth and some are cauliflower. They range in colors from pink to black. There is speculation about different stages of the disease causing these outward appearances. The paps on the left are slightly necrotic. The one to the right was large extremely dense and would adversely affect the animal's ability to swim. Tumors are most prevalent on intermediate size turtles, which would be why we have not had any tumors on our cold-stun turtles. All of our animals are juveniles approximately 2-5 years of age. It is very rare to see these tumors on adults. Also, the majority of FP cases come out of areas with high levels of pollution, such as lagoons, estuaries, shallow areas and, from what I have been told, Florida's Intercoastal Waterway. You can see on the turtle above how the large tumors would weigh the animal down and limit it's ability to escape predation. Currently there is no cure or treatment for fibropapilloma the only way to clear it up is to surgically remove the tumors. Researchers are still unsure as to how the tumors are triggered and how the virus is transmitted. There is still a lot of research to be done. We went to Florida because of our expertise in cold-stunned animals, but I learned a lot about FP. This was just some information I learned while helping out, and by reading some journal articles upon our return to Boston (you, too, can read them here, here, here and here). This was our last full day at the Gumbo Limbo Nature Preserve and it was another action packed one. Above Cleon, Juan, and Anthony treat turtles. We started first thing by treating a small green sea turtle with it's last dose of antibiotics and I checked its eyes to make sure it had no corneal lesions so that it would be ok for release. This turtle was down in the area that has been affectionately proclaimed "pap" land as all the turtles have papilloma tumors. This is the area I have been working in for the past few days. This little guy had no stain uptake and was cleared for release. After confirming this turtle had no corneal lesions it was slated to be released with three other turtles later in the day. Thanks so much to Cody for shooting this video as he was releasing the turtles. As we continued on through the day looking at different papilloma tumors, treating eye injuries, and determining if animals need to extend their treatment Dr. Milton was collecting tumor samples for her research into the progression of the tumors. While the turtles were waiting to be placed back into the water as they sat out with their eye treatment, samples of various tumors were taken. Her research sounds really interesting and hopefully it will help the turtles in the future. Above you can see Dr. Milton and Heather collecting tumor samples. As we finished our treatments I took a quick look off the back of the large tank and just appreciated the view. Our team then went up to see if Connie and her group needed any help. They had just finished as well. They only had some turtles out finishing their eye treatments for the day (as seen below). 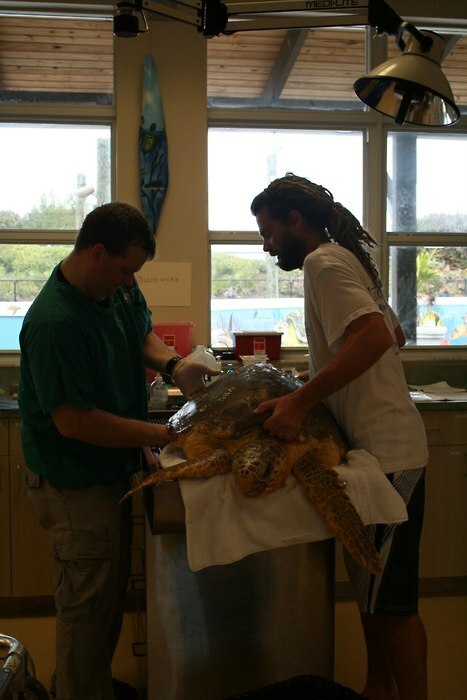 Once those treatments were finished we then started to try and get some more turtles eating. As with our turtles back in New England it can take some time and effort to get cold-stunned turtles to start eating again. We all concentrated our efforts on the tanks and got some turtles eating that were not and piqued the interest of other turtles which nibbled at but never ingested the food (which is a good sign!). Hopefully they will all be eating within the next few days. We are heading back to Boston tomorrow. It has been quite an adventure! Another long day fighting crime in the battle to save cold-stunned sea turtles here in Florida. Today we have good news and sad news. I'll start with the good news. The little green sea turtle that came in the other day with the hook in his mouth was released back to the big blue! The hook was lodged in a tricky manner however the hook removal went well and had minimal impact on the animal. Unfortunately we lost #63. 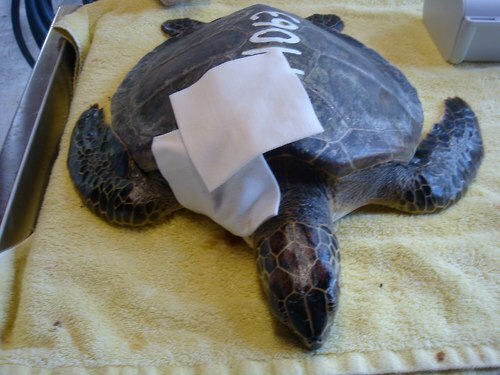 This was the turtle with the severe traumatic injury. The wound was a very serious full thickness penetrating wound. Dr. Mette felt that the wound originated at the circular fracture on the lower shell and penetrated upward fracturing the carapace, or top shell. The prognoses for this animal was poor but we all wanted this little turtle to beat the odds. Dr. Mette did everything she could, monitoring its health and providing emergency care late into the night. In the end the injuries combined with the hypothermia was too much. Another case I worked on today is #59. Number 59 is an adult female green sea turtle weighing over 200 kilograms. This animal has an elevated white blood cell count indicating a serious infection. Number 59 is too large to remove from her tank daily for treatments so we drained her pool in the morning and administered her antibiotics. She had been eating some so we decided to administer her antifungal medication in her fish. As my luck (or lack there of) would have it she didn't eat. I had to drain the pool again and jump in there this evening to give her the antifungle meds. In the left most photo, Cody and Anthony watch the levels of the replacements fluids. In the center and right photos, I was able to get close up photos of this beautiful creature while I was in the pool administering her evening medications. As you can see she has corneal tumors. This evening we had two new turtles arrive. Both were heavily burdened with paps. I was still working in my area but snapped a few photos of Rick, Cody and Dr. Mette as they completed the intake exam, took blood samples and gave fluids and medications. Both animals were bright, alert and responsive and were allowed to go into pools after their treatments. Both were swimming well when we finally left for the night. The case load here continues to grow, however at a much slower rate now. The days are long and exhausting but the work is important. Adam and I only have two more days here and while it will be nice to go home, it will be difficult to leave these animals and the incredible staff on the Gumbo Limbo sea turtle team. Treatments, emergency and surgery - all in a day's work. 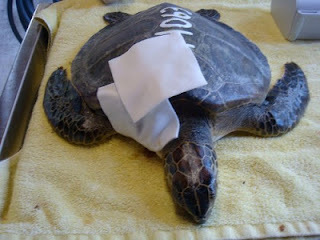 Turtle #63 after a surgical procedure on its plastron. 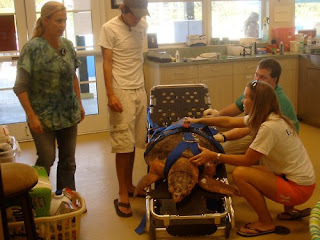 While Adam was working with a large group of turtles on the other side of the Gumbo Limbo Nature Center, I was stationed in the Rehab Center with another team. As if we didn't have enough to do, an emergency case came in while we were in the middle of treatments. A women came up to the viewing area and told me she had a turtle that needed help. She was holding a small drink cooler in her hands and said a fisherman had just hooked a small turtle. She collected the turtle and brought it to the Gumbo Center. The turtle was a very small green turtle and indeed, it did have a hook lodged in it's tongue. It wasn't an easy removal so we called Dr. Mette over for consult. In addition to routine treatments we had a few surgical procedures. Sea turtle number 63 came in the other night in the shipment of 28 animals. This animal had a severe penetrating traumatic injury. #63 is in critical condition and his prognosis is not great. Lead by Dr. Mette we are doing everything possible for this animal and all the others in our care. I'm reserving a lot of hope for #63, his injuries are severe but a little hope can't hurt. After seeing Connie's post, I thought I would add more about our adventure down at the Gumbo Limbo Nature Center. After helping to intake close to 30 turtles, including an adult green weighing close to 400lbs, the decision was made to stay down at the nature center for a couple of full days. Today was our first day. The majority of turtles here are fibropapilloma (FP) turtles. They have tumors upon tumors, and some that are extremely dense and encompass a large part of the animals' soft tissue. We have seen tumors around eyes, embedded in wounds, as a matter of fact, I do not think there is a place that I have not seen an FP tumor on these animals. We have also seen some traumatic injuries. Cracked shells, puncture wounds, and monofilament injuries to name a few. Another busy day down here in Florida. Adam and I started our day at the Loggerhead Marinelife Center. 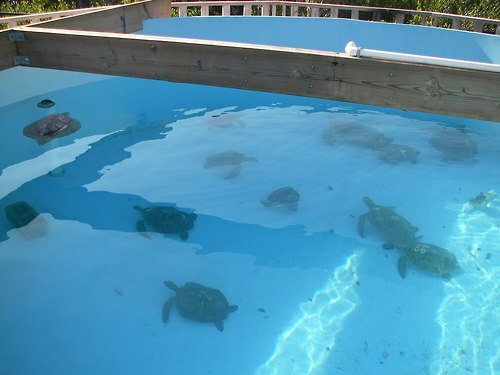 We worked with the Center staff on medical treatments and performed diagnostics on the turtles in their care. We had to work fast since we knew there was a shipment of cold stunned arriving at the Gumbo Limbo Nature Center at 4:00PM. We created a system where the animals were numbered and photographed as they went to the intake station. At the intake station they received a full physical exam and blood was collected. From there the blood was run instantly and medical plans were written by the attending veterinarian, Dr. Nancy Mette. A team of medical professionals prepared the prescribed medications, which then went to one of the three treatment teams. 28 animals is a lot to assess in one day, not to mention Gumbo already has a high number of patients. Everything ran smoothly and the animals benefited from the preparation and organization of the Gumbo staff. This was a long day and tomorrow will likely be the same. All these new turtles will be treated and examined again tomorrow, along with all the others. Why are Connie and I down in Florida? As some of you may be aware Florida has undergone a severe cold stunning event. Over 3,500 sea turtles stranded across the state in a very short period of time. Tom from the Loggerhead Marinelife Center and I move a loggerhead sea turtle. The number of animals being brought to the various facilities was astounding. Connie had been in touch with a variety of groups that were working around the clock to help these turtles. Recalling the hours we had to work in November during our own cold stun event, we thought maybe they could use a hand. Once we received approval we packed up, shipped supplies and headed down south. We are currently working at two facilities, the Loggerhead Marinelife Center in Juno Beach and Gumbo Limbo in Boca Raton. 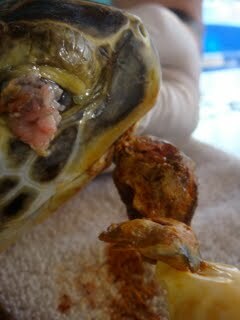 This is the first time I have seen fibropapilloma(FP) on a sea turtle. Boy, did I get to see FP. This is going to be a crazy week. Stay tuned for more blogs from Florida. I thought I would provide an update for one of the intensive care cases I reported on a couple of weeks ago...or was that a couple of years ago?! Forgive me, it's been a busy season. #118 was the second to last turtle of this cold stun season to come to the Aquarium alive. You may recall that this animal arrived very hypothermic and had several significant blunt trauma injuries, in particular to both eyes. the eyes and nares (nasal area) on the animal before we cleaned him up. This animal remains in the intensive care ward but is showing great improvements. He is not eating on his own yet but is beginning to show promising signs of interest. I discussed this case today with Dr. Cavin and we decided to tube feed #118 tomorrow a small amount of fish gruel to help jump start his gastrointestinal system. That may help promote interest in food. We continue to treat the eyes and the eye lids daily to promote healing. We are also treating other blunt trauma injuries on this animal but the eyes are the most concerning, hence the focus here. I'll feel better when 118 is eating on his own. Last Wednesday, we were able to successfully bring the harp seal that was traversing the Massachusetts coastline to the Mystic Aquarium in Connecticut for rehabilitation. You may remember from Connie's earlier post, this seal had gone into the water only to resurface a day later in Quincy. Although it is normal for a seal to be hauled out for a period of time, this seal had larger patches of alopecia (hair loss) and was becoming much more lethargic. Also, one of the eyes was starting to have some off-color discharge that was concerning. 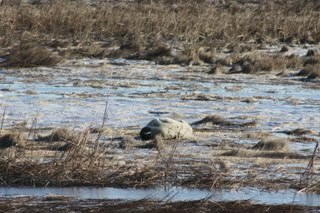 The icy water of the marsh in front of the seal at high tide. We gathered our materials and were ready to go out in the morning to get the seal. But first, I had to pickup a dead sea turtle in Weymouth. After that was accomplished, I quickly stopped by the area the seal was resting. Unfortunately, we were in the midst of an astronomical high tide and the animal was in an area that was unsafe for us to attempt a rescue at that time. One of our field volunteers in the area went out at mid-tide and deemed it safe enough to proceed with capture. I and two of the in-house rescue team volunteers headed out of the Aquarium for a second attempt at the rescue. We met up with two field volunteers and went down into the marsh. As I went for a closer look I noticed the seal was chewing on some of the marsh grass. This could be from stress of my approach, or there is some belief that ice seals may chew on the pack ice to relieve dehydration and when they are off the pack ice they may chew on rocks and grass mistaking it for ice. As I got even closer to look for any other wounds or possible concerning issues that I would need to be aware of during capture, the seal lifted its head and barked and growled at me. Although these are good signs of alertness, harp seals are known to play dead so they are not always this animated during a capture. Below you can see video of the capture shot by Emily Bauernfeind as she rode along with the rescue team. The seal is currently at Mystic Aquarium undergoing rehabilitation.